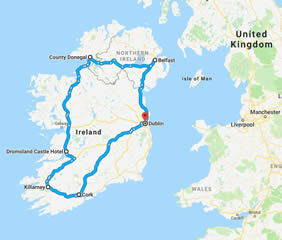 Dublin, Glendalough, Kilkenny, Cork, Glengarrif, Killarney, Ring of Kerry, Gap of Dunloe, Shannon, Dromoland Castle, Killarney, Mohr, Donegal, Derry, Belfast, and more! 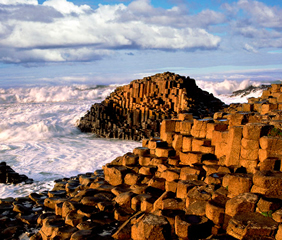 This 12-day gay group tour of Ireland is a journey of discovery, highlighting not only the many renowned sights, but going off the beaten track as well – with adventures that take you from Dublin to parts of Ireland’s Ancient East, over to the the Wild Atlantic Way and up to the North West coast to Belfast, and back to Dublin. Walk on the historic Walls of Derry, and enjoy a pint of Guinness in the Storehouse visitor center. 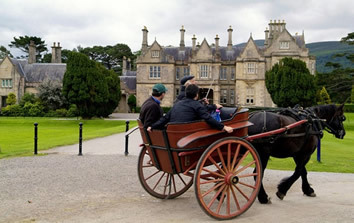 Enjoy two overnights at the historic 5-star luxury Dromoland Castle. Other highlights include touring the Ring of Kerry, Cliffs of Moher, Garnish Island, Gap of Dunloe and a Black Taxi tour of Belfast. Our adventure begins with a visit to the Guinness Storehouse. 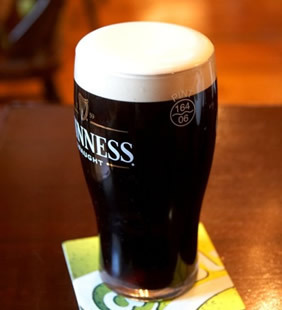 There, you’ll learn how the famous brew is made and discover the secrets of Guinness, as well as sample it! The Guinness Storehouse is the visitor center of the Guinness Brewery, a warehouse of the original brewery (founded in 1759) that has been transformed into a hi-tech visitor center covering 6 floors. Containing 3 bars, the visit culminates with a pint of the ‘black stuff’ in the Gravity Bar on the 6th floor (Dublin’s highest pub), where you can also enjoy 360-degree views over the city. Try your hand at pint-pulling while enjoying a lunch at this spectacular venue. Continue with an afternoon walking tour of the city. Experience the 2,000-year-old capital city by exploring some of its beautiful architecture, ancient city walls, and backstreets alive with history, heritage and culture with a local expert. This morning, we head to the monastic ruins of Glendalough. 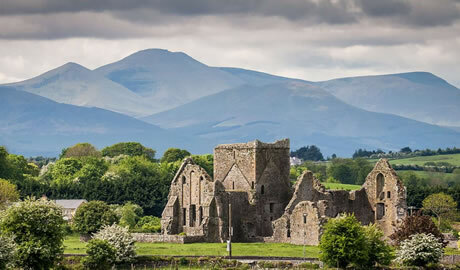 Established by St. Kevin in the 6th Century, its ruined churches are scattered around two lakes. One of Europe’s finest examples of Round Tower architecture can be found here, as well as a Cathedral, stone churches and decorated crosses. This afternoon, visit Ballyknocken Farm and Cookery School, home to celebrity chef Catherine (Byrne) Fulvio. Here, you’ll have the opportunity to prepare your own lunch in a hands-on cookery class, using one key ingredient: Guinness. Return to Dublin for a dinner together at Beef & Lobster restaurant. After a hearty included breakfast at the hotel, we travel to the medieval city of Kilkenny. Kilkenny’s rich medieval heritage is evident in the city’s treasure trove of historical buildings and landmarks, exemplified by the magnificent Kilkenny Castle. Kilkenny is arguably the pre-eminent medieval city in Ireland, with the current layout of the city clearly grounded in its medieval roots. However, the city’s origins predate the medieval landmarks existing today. Saint Canice founded a monastic settlement in Kilkenny in the sixth century; unfortunately, the sole remaining landmark from this settlement is the round tower positioned alongside the cathedral. Strongbow, the legendary Norman invader, built a fort in the twelfth century on the site where Kilkenny Castle stands today. Subsequent to this event, William Marshall (Strongbow’s son-in-law and Earl of Pembroke) oversaw the building and maintenance of fortified city walls, thus consolidating the Norman’s position of power in the city. However, it wasn’t until the seventeenth century that Kilkenny really entered its golden age. The parliament, known as the Confederation of Kilkenny was founded in 1641. One of the parliament’s main objectives was to unite resistance against English persecution of Irish Catholics. With the emergence of this parliament, Kilkenny entered a period of unparalleled success. Over time, however, the influence of the Confederation of Kilkenny diminished. Oliver Cromwell’s arrival in Kilkenny heralded the dissolution of the parliament, and the city never quite regained the prosperity it had previously been celebrated for. Transfer to Cork, where you will enjoy the remainder of the day and evening at your leisure. Overnight at the River Lee Hotel. Today’s touring includes Garnish Island, located in the sheltered harbor of Glengarriff, in Southwest Ireland. Garnish is world renowned for its beautiful gardens known to horticulturists and lovers of trees and shrubs all around the world. Enjoy a traditional pub lunch en route to Kilarney. Enjoy three exclusive overnights at the Ross Hotel! Dinner tonight in the Cellar One restaurant. 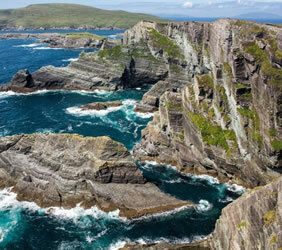 Today, enjoy a full-day Ring of Kerry Tour. Travel the road that winds around the beautiful Iveragh Peninsula, better known as “The Ring of Kerry.” It is undoubtedly one of the most magical places in all of Ireland. 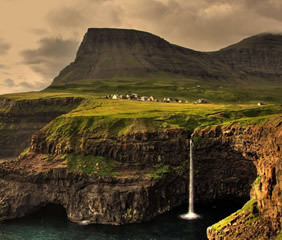 Perhaps choose an optional excursion to meet a local specialist for a half day of hiking. Enjoy a beautiful walk out of Killarney to follow an old “Butter Road” and climb Torc Mountain and soak in the incredible views. Return to Killarney, with evening and dinner is at your leisure. Tonight, enjoy dinner and entertainment in Jarvey’s Rest, an award-winning Irish Pub and the perfect venue for a genuine pub experience, with gastro pub style food, a choice of Irish drinks and live entertainment. This famous Irish pub still contains original wooden floors, stonewalls, beamed ceilings and open fires. After breakfast at the hotel, we travel toward Shannon with a stop in Adare Village for a traditional Irish lunch. After lunch we head to historic 5-star luxury Dromoland Castle, where we will stay the next two nights. When you arrive to Dromoland Castle there is a very special treat in store for you. Waiting at the gates will be our horse and hounds. As the coach pulls in to the gates of the Castle, the horse and hounds will ride along side you. This is without a doubt one of the most impressive ways to arrive at any venue. This afternoon, take in one of the many daily activities offered on the grounds. Dinner tonight onsite at The Golf Club House. Today we start with a visit to Bunratty Folk Park, a recreated 19th century village complete with houses (from a small laborer’s cottage to a grand manor house), shops, a pub and a school. Following our visit to Bunratty, enjoy an included lunch at Vaughan’s in Liscannor. 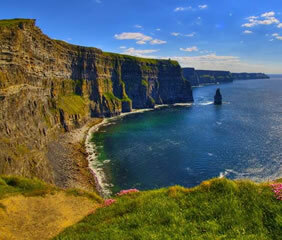 After lunch, we visit the Cliffs of Moher in County Clare, which are Ireland’s most visited natural attraction. With a magical vista that captures the hearts of one million visitors every year, the Cliffs are a Signature Discovery Point in the heart of the Wild Atlantic Way. They stretch for 8km (5 miles), as the crow flies, along the Atlantic coast of County Clare in the west of Ireland, and reach 214m (702 feet) at their highest point at Knockardakin just north of O’Brien’s Tower. Here, you can have a world-class, one-in-a-million visitor experience. Next, the Burren is an area of karst landscape in County Clare. The word “Burren” comes from an Irish word “Boíreann” meaning a rocky place. This is an extremely appropriate name when you consider the lack of soil cover and the extent of exposed limestone. However, it has been referred to in the past as “Fertile rock” due to the mixture of nutrient rich herb and floral species. Tonight, dine at the internationally renowned Earl of Thomond Restaurant. This morning includes a stop at Westport House, undoubtedly one of Ireland’s best loved heritage attractions – and is rightly called the most beautiful house in Ireland. With over 30 rooms on show, immerse yourself in life as far back as the 16th century when Grace O’Malley the Pirate Queen of Connacht ruled the land and seas around the estate. Built upon the foundations of one of her many castles which can still be toured in the dungeons today. The original Westport House was built in 1650 by Colonel John Browne and his wife Maud Burke, Grace O’Malley’s great-great-granddaughter. Following the Wesport House, we will stop for lunch in town before arriving in Donegal and checking in at Harvey’s Point. Dinner is included tonight at the hotel. Our first stop today is at the walled city of Derry. A walk around the walls in Derry reveals a splendid city crammed full of history, heritage, interest and a vibrant cultural scene. This is the only remaining completely walled city in Ireland and one of the finest examples of Walled Cities in Europe. The Walls were built during the period 1613-1618 by the Irish Society as defenses for early seventeenth century settlers from England and Scotland. Our next stop is at the Carrick-a-Rede Rope Bridge, which is suspended almost 100 ft (30 m) above sea level, and was first erected by salmon fishermen 350 years ago. Today it is a popular attraction for thrill-seekers and birdwatchers. If you are bold enough to cross the 65 ft (20 m) bridge, stretching from the mainland to ‘Rocky Island’, you will be rewarded with fantastic views of Rathlin Island, Scotland and the Causeway Coast. Get a bird’s eye view of the clear, green water flowing around the ancient caves and caverns far below – if you dare to look down. Tonight, we enjoy dinner together at Deanes Meat Locker, before settling into the 5-star Merchant Hotel for a relaxing night. This morning, enjoy a Black Taxi Tour of the city, including Shankill and Falls Road, and learn of how things were during “The Troubles”. See the wall murals that are known all over the world. Every mural tells a story, which will be explained in great detail. Then, we will take you to the famous peace wall that separates the Protestant and Catholic communities, where you’ll get a chance to sign your name on the wall. After morning touring, we stop for lunch e route to Dublin at Tankardstown House. This afternoon, we head to the Neolithic ruins of Newgrange, constructed over 5,000 years ago, making it older than Stonehenge and the Great Pyramid of Giza. Return to Dublin for check-in at the Morgan Hotel, before dinner tonight at Peploes restaurant. Under glittering Dromoland Castle antique chandeliers descend grand staircases and meander through elegant hallways and beautifully furnished rooms. Luxuriate in plush, sink-in sofas in front of large, ornate fireplaces with blazing log fires. Relax as our unsurpassed, experienced and friendly staff takes special care of you. The Earl of Thomond’s Restaurant offers you a heavenly dining experience you’ll remember forever. And cocktails in Dromoland’s Library Bar are sublime, so go on treat yourself. Dromoland Castle is also within easy reach of the wonderful Wild Atlantic Way, the Cliffs of Moher, the Burren and all the delights that County Clare and County Limerick have to offer. Conveniently close to Shannon International Airport, Dromoland Castle is the perfect place for your perfectly idyllic vacation. Harvey’s Point hotel offers lakeside tranquility and natural beauty combined with calm seclusion and the finest in cooking and accommodation — all this in a modern, gleaming family-owned property. This luxury hotel has a magical location amid the Bluestack Mountains, on the edge of Lough Eske. 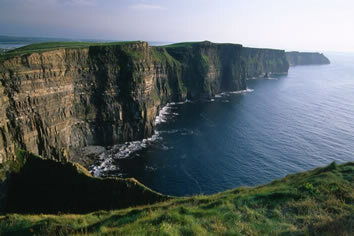 It is 6 km from Donegal town and offers gourmet food and a romantic atmosphere. Harvey's Point restaurant has 2 AA Rosettes and provides relaxed, elegant dining. Food is made using locally sourced ingredients. It is ideal for fishing, horse riding, golf and hill walking.